Are you ready for the coolest Austin water slide rentals? You've landed at the right place! 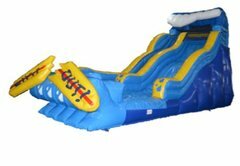 Here at Jump Around Party Rentals, we have some of the latest and greatest when it comes to water slides. 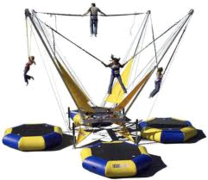 With sizes ranging from 13 ft tall to 27 ft tall, we have something for every age group out there. Available in bright colorful themes, our slides go with just about any type of event. 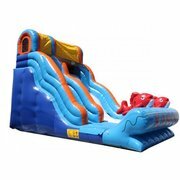 Choose from large slides decorated in variety of wild themes and colorful slip n slides that offer multiple lanes and excitement for guests of all ages! 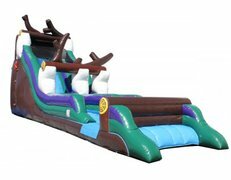 Don't take our word for it either, check out some our most popular offerings for yourself, which include the Double Lane Fire N Ice, the Lil Kahuna Water slide, the 18ft Blue Marble, and more!These awesome inflatable Austin waterslide rentals are a great option for backyard birthday parties, school events, church functions, festivals or other large social events. 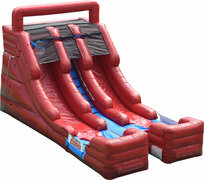 At Jump Around Party Rentals we only have high-quality Austin waterslide rentals at an affordable rate. However, affordability and quality come hand in hand to a certain extent. 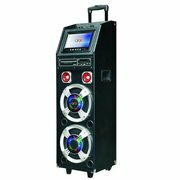 We provide the utmost top-notch professional rental service to our customers they have become accustomed to. 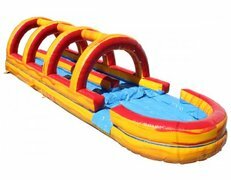 We may not have the cheap Austin water slide rentals but you can rest assured you will not find a dirty, molded or torn apart inflatable here! 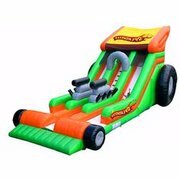 Each one of our inflatable water slide rentals are carefully inspected before we leave your event. Your satisfaction is important to us and we want you to be able to relax and have an epic time on our waterslides. 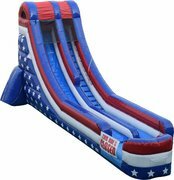 Reserve your waterslide rental with Jump Around Party Rentals today! 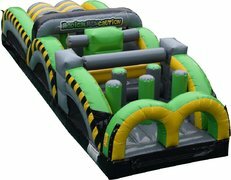 When booking your inflatable, be sure to include details on time constraints and other delivery notes! Also, for weekend parties, we can sometimes deliver a day or two earlier, simply include on the notes whether this is ok as well. 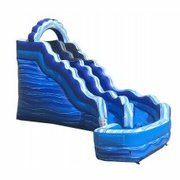 Click below for the best waterslide rentals in Austin! 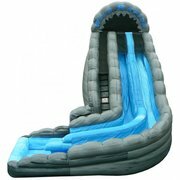 All of our Austin water slide rentals feature some type of catch pools whether it's a splash landing or large pool at the end for the participants to splash into. What a rush! Each slide comes with a sprinkler system to keep you cool in the hot Texan sun. 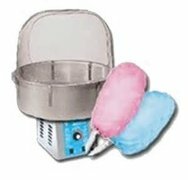 No other better way to beat the summer heat. Couple that with some great friends or family and you have a recipe for a great experience! 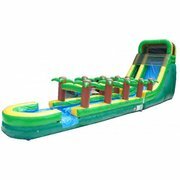 Jump Around Party Rentals spares no expense when it comes to water slides. 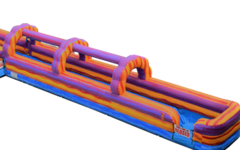 Putting smiles on your guest's faces comes easy when they see our giant inflatable slides setup at the event. When they arrive, its pure amazement of the sheer size and colors of our units. 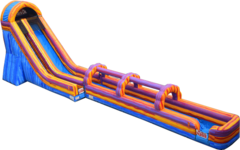 There is a reason we are the top-rated Austin water slide rental company in the Austin, Texas area. 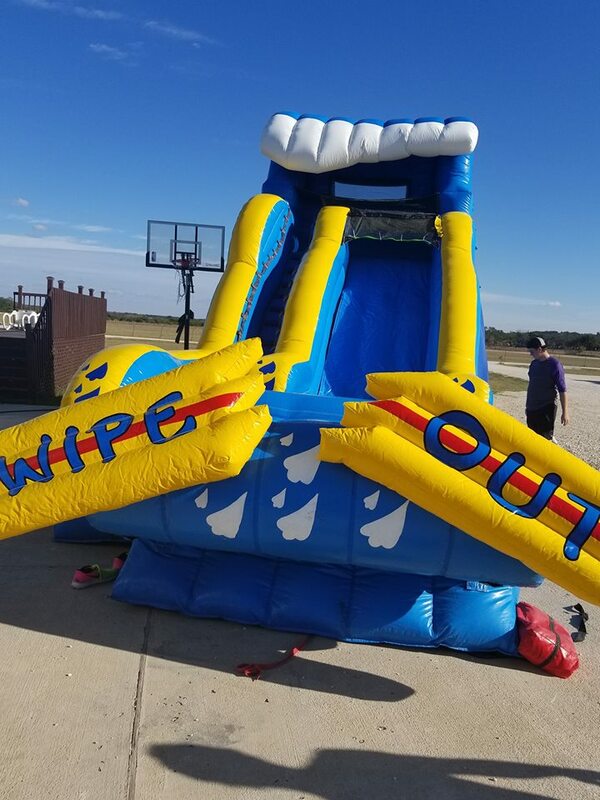 Our customers love Jump Around Party Rentals for their Austin Water slide Rental because we are a company they can trust and rely on for their party or event. 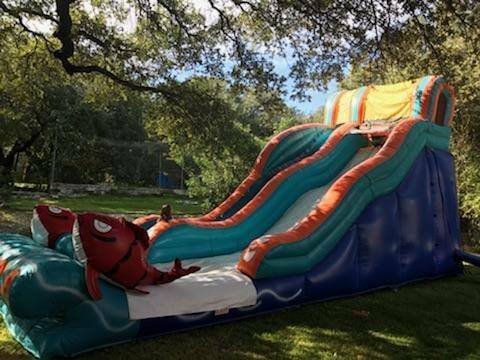 For years, we have been providing our customers with the most unique Austin water slide rental anyone has ever seen. 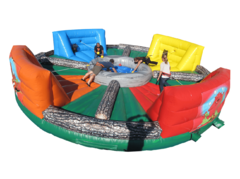 All of our inflatables are commercial grade and made of lead-free vinyl. 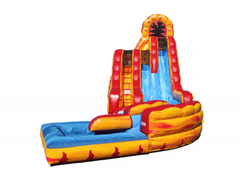 We clean and sanitized each inflatable after every rental for your kid's and guest's safety. Put your trust in us for safe and FUN time! 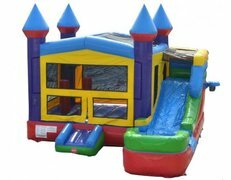 When renting a water slide from Jump Around Party Rentals, you can expect a memorable experience from the first interaction until after the event is over with. There is a reason for that! 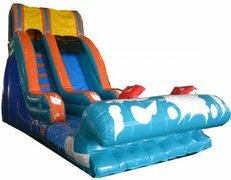 We are one of Austin's premier source for water slides in the Greater Austin Metro and surrounding areas. All of our options will fit within a range of budgets so everyone can afford one of our great water sides without breaking the bank. Our professional delivery staff is knowledge in the safe set up and operation of each inflatable delivered to your event. As a customer, you literally have to just point them in the right direction where to set it up, power source location and water source. It's that easy! Booking your Austin water slide rental is just a few clicks away. 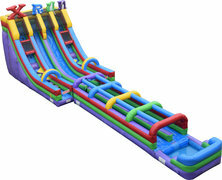 If you are reading this then you are already looking at the best selection of Austin waterslides! 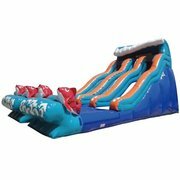 Just browse which one of the cool inflatable water slides you're interested in renting. 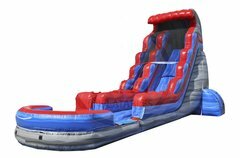 Once you've decided just click the Add to Cart button to select the inflatable. After that, you just need to follow the prompts to select the date and time, enter customer and event information, payment information for a deposit and digitally sign your contract. Nothing to it! Just like buying anything else online on any other website. 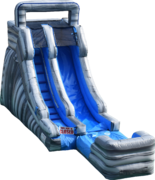 Our goal is to make it easy and convenient to book your Austin water slide rental online at the convenience of your schedule. We understand its stressful enough trying to plan a party or event so we decided to make it easy to browse and book any time of the day 24/7. The inventory shown on the website is live and accurately reflects availability. If you already know your date and time of the party just select the order by date function to see what's available in our inventory for the specific date. Easy peasy! Nothing better than hosting a party at some of the beautiful parks Austin has to offer. In over the years, we have delivered to just about all of them in the Austin area. Depending on which park you decide to host your party at, please check City of Austin's Parks and Recreation for any restrictions for renting water slides. The majority of parks don't allow you to use the shelter or pavilion electrical source so you will need to rent a generator. Don't worry, we have those too for you! All of the parks in Texas require a minimum insurance policy for the rental company for your event. We have all the requirements as we are fully licensed, inspected and insured in the State of Texas. Keep in mind, some parks may not allow water slides to be set up at the event. If that's the case, just head over to our dry slides to see if there is something that will work for you. 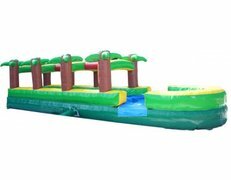 All in all, we will have the perfect Austin water slide rental for you or any other type of inflatable rental you can think of. 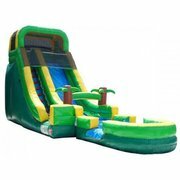 Austin's one stop party rental shop for anything water slide rentals Austin related!